This is my favorite piece of equipment while pursuing quail on the heartland prairies. Below are the details per Filson’s website. I’ve had several of them…they’re virtually indestructible too! 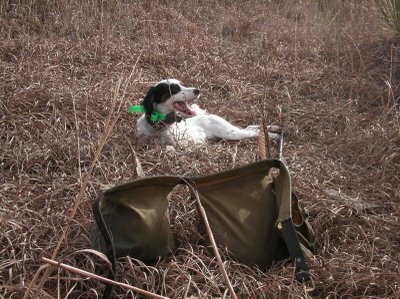 I have carried water for the dogs, shells and 3 roosters and 8 quail in my bag for several hours on a glorious day in NC Kansas! Oil Finish Shelter Cloth, 8.5 oz. 100% cotton, 2 ply by 2 ply, paraffin treated for maximum water repellency. Genuine Bridle Leather, 100% cowhide, vegetable tanned. Oversized to be worn over your hips, with extra room for bulky clothing–order by your waist size. Customers at the small end of a size may want to order one size down, if worn over normal clothing. How do I clean and care for my Genuine Bridle Leather Belt? Clean away surface soil or buildup by wiping with a damp cloth, or scrubbing with a brush, using warm water to loosen up any caked mud or dirt if necessary. DO NOT professionally dry clean or machine wash. I just received my new belt, and some of the bridle leather has this whitish film on the surface. What can I do about this? New bridle leather may form a milky looking film on the surface, resulting from natural waxes in tanning process. This can be removed by wiping down the leather with a clean, dry, soft cloth. 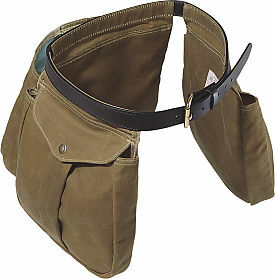 >wn, I;ve had one of these bags for year,and it’s great for dove and quail hunting – no vest to sweat into!And I know you are getting a commission from Filson… admit it!